This is a different artist and I really like the art work. This artist feminized the women alittle and I think it’s pretty. That was for the first story. I’d give that story 5 stars. The second story I don’t like the art as much, the art is done by yet another person and the people look cartoonish and weird but not terrible. The second story I’d give 3 stars. So overall 4 stars. Still a great series. 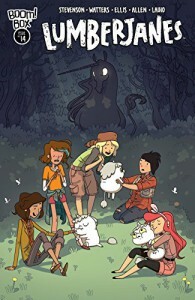 I might need to take a break from Lumberjanes though. 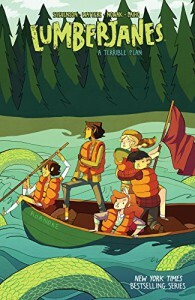 Description (From Amazon): What’s to Love: Not only does this oversized one-shot feature a whopping 40 pages of brand-new, original, Lumberjanes stories, but we welcome two of our favorite creators to the campground: writers Jen Wang (In Real Life, 2017’s The Prince and the Dressmaker) and Kelly Thompson (Jem and the Holograms), and artists Christine Norrie (Hopeless Savages) and Savanna Ganucheau (Fresh Romance)! What It Is: Jen takes the girls on a nature walk to show them which plants are edible in case they need to survive in the wilderness. Along the way, she tells them the story about an axe murderer who took his friends out, one by one until no one was left, thoroughly scaring Mal. Terrified and unable to sleep, Mal thinks she sees something lurking outside. Is it...THE AXE MURDERER?!?! For some reason, this 42 almost 43 year old woman loves comic books and young adult comics and graphic novels. 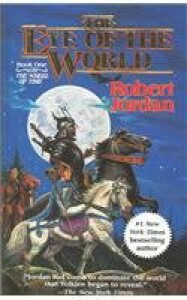 This is actually younger than young adult but I still love this series. This issue or book is done in black and white and blue which adds to the mood of the frozen topic. Of course there is a talking cat, and I always love talking animals. Great addition to the series. Made me smile and laugh. This book is seriously funny on serious topic that I can relate to. Hopefully this is the issue that ties everything up with this more serious story line. I’m waiting for the silliness to come back. Good issue but I’m ready for the silliness to come back. 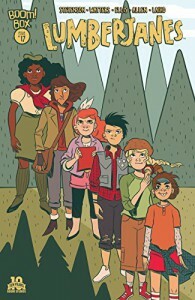 This issue starts out with a flashback to when Rosie was a lumberjane and the Bear woman was the leader of the Lumberjanes. The girls are reunited with Jen and Rosie. The girls are told to stay out of danger, but do they listen? Of course not. I won’t say any more, but it’s still a very intense issue and not much humor but it’s still a good story line. Great series still but I know i’m inching closer to the new artist who i didn’t like as much. I'm abandoning this. This is just not doing anything for me. Bummer. Lots of abandoned stuff recently. Issue 15 continues the plot from Issue 14. Jen is holed up with the mysterious person Abigail. The girls, with Barney from the boys camp, have gone off in search of Jen. Trouble of course ensues. This is a much more serious story line than we had before so it’s hard to compare it to the previous issues. I really do like this story line still though. Still a highly recommended series. 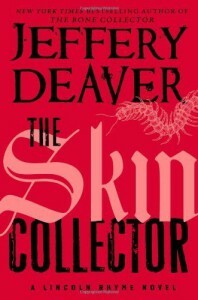 I was so excited when I came back to reading that there were two more Jeffrey Deaver Lincoln Rhyme Novels. I love this series but I don’t really like the Katherine Dance novels that much. I read the Kindle edition and there were some minor formatting errors which were a little annoying but I lived with them. The beginning is a bit slow and a bit formulaic (is that a word?). But just when I didn’t think I could take the play by play content of going over the crime scene again things begin to get interesting. And of course all the damned tables which make up filler space for me have shown up.. Those are really annoying to me. And I was hoping they were dropped. What is interesting about the book is the premise. Like most of the novels in this series, the book starts with a murder of a youngish girl. The murder killed her by tattooing her with poison. I have no idea if that’s even possible but it’s an interesting topic. I love tattoos (I think I have close to 10 individual tattoos) so this concept is pretty cool to me. I read somewhere around 75% of the book and I think that’s a fair amount to give a review of the book. This was way to formulaic and it got very boring. I don’t want to waste my precious time finishing the last of this book when I don’t really cares what happens that much. A freak snowstorm hits while the girls are camping. Jen gets seperated from the girls in the snow but is rescued. 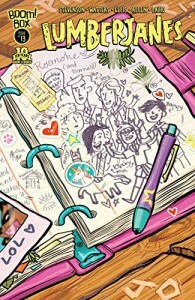 Rosie rescues the girls and then goes and looks for Jen who is rescued by a mysterious woman named Abigail. Abigail has been killing the monsters in the woods so of course I don’t like her. Who kills unicorns and Jackalopes?? It turns out Abigail was a lumberjane with Rosie. Meanwhile the girls go against Rosie’s orders and are out searching for Abigail. I’ll leave it at that because I don’t want to spoil too much. I think I’m going to increase my rating for this issue from 3.5 to 4 stars. It really wasn’t bad but it’s not as good as some of the funnier ones. Definitely still worth buying and reading though. In which we learn about the girls and how they ended up at the camp. Jo has two fathers. YEAY for LGBT characters (I know I keep saying that). Ripley is from an interracial (YEAY) family with lots of kids. April is the daughter of an elderly looking gentleman. April and Ripley bond. Mal isn’t shown with her family, she just shows up in a taxi. April is the reason Ripley has a blue streak in her hair. The girls end up having their first adventure not long after all meeting up in the cabin they share. They end up meeting Bubbles the raccoon. Molly and Bubbles end up being friends. Just as awesome as all of the previous issues. This series is just freaking amazing. OMG I'm never going to finish this. I will probably skim the rest of this tonight because this is killing me. I do want to know what happens but i don't need to know every breath Lincoln Rhyme makes. I love how sweet Victoria is and her love for her family. I love her kind of steampunky glasses. I love the artwork. Anyway I think I’ll give this 4.5 stars because it wasn’t quite 5 but it was still really good and juicy and lots of fun. Crossing my fingers there will be another one. 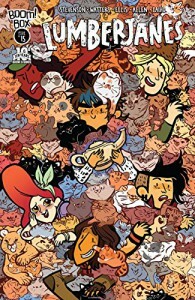 Overall: Despite starting with an issue I didn’t like very much, i still want to give this volume 5 stars. I loved it a lot. They are funny and delightful. This is such a great read. After this I’ll be going back to re reading the individual issues again. 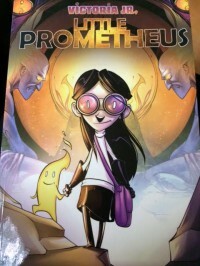 Notes: Issue 9 Starts with a different illustrator because Jen is telling a story. I hope I’m not at the point already where the new illustrator takes over. Anyway the girls are telling ghost stories and as they are doing so, a different illustrator takes over. I’m not terribly thrilled with this issue so I’m kind of skimming the stories. When the girls are done with their stories the bear lady appears. 3 stars for this chapter/issue. 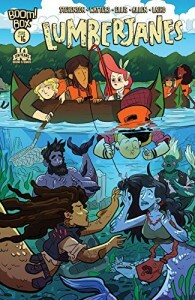 Issue 10 the girls get a free day at camp. Molly and Mal go off on their own. Ah hem. LOL. The rest of the girls are just hanging out. The Bear lady appears. Ripley and bubbles are dancing in the background of some scenes and it’s hysterical. There are some dinosaurs and total funness ensues but it ends kind of abrubtly. But this issue was much better than issue 9 which was just a fluke I suppose. Issue 11. We pick up where 10 left off. I absolutely love this issue. Chapter/Issue 12: Mal and Molly have a plan to get back to reality. Meanwhile the other girls are still trying to earn a normal badge. Another fabulous issue. And of course there is a cover gallery at the end. Can't wait to read these! I need more time to read darned it! Reading progress update: I've listened 304 out of 1800 minutes. Some of the wordier passages (and Jordan has many) are a bit hard to follow while listening on audio. But as this is a reread, I'm not worried about it. I'm not sure if I"ll be able to do new books this way but maybe.